Abi Kim has roots that run wide and deep. She calls Vashon, Washington home, but was born in Liberia to a Ghanaian father and a Liberian mother. At age three, she was adopted and came to the United States. Ever since, she’s been raised by her Korean-American father, Jin, and British mother, Sue, who have played a major role in her path to represent the United States at the 2018 FIFA Under-20 Women’s World Cup. 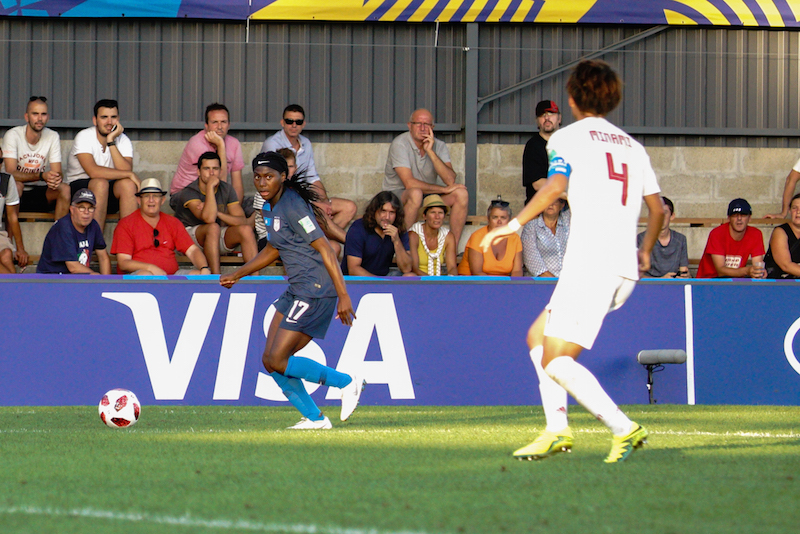 Her origins in soccer-mad West Africa may have set the foundation for her soccer success, but her adopted family guided her down the path to take on the world in France. Before she committed fully to soccer, Kim used to star on the track and on the hardwood. Wherever she competed, she stood out as the fastest player on whatever surface she ran on. As Kim grew up, she started to get more serious with both soccer and track. As early as her freshman year of high school, the Unversity of Oregon, a standard-bearer of collegiate track, expressed interest in her talents on the oval. Kim faced a tough decision as she looked to focus on a single sport. In the end, soccer had an unsurmountable advantage over track. The sport was intertwined with family, a theme that has permeated her life since she joined the Kims in 2001. By the end of her freshman year, Kim had committed to play at the University of California-Berkeley for the Golden Bears. She did keep running track “for fun” and led the Vashon Island Pirates to four straight state championships. In October of 2015 during her senior year, she received an e-mail she never expected, and would never forget -- an invitation to a U.S. U-18 Women’s National Team camp in Chula Vista, Calif. The forward had seen U.S. Soccer scouts at her club games while playing for Pac Northwest, but she assumed they had come to watch a teammate. Kim made an impression in that first event. After two years spent with the U-18 and U-19 WNTs during the 2015-16 cycle, Kim earned an invite to the first camp of the new U-20 WNT cycle in March of 2017. She has been invited to every camp since with the U-20s. Kim chose soccer as her sport because of its family aspect and the U-20s have developed into the kind of close-knit group that made her fall in love with the game even more. In 2018, the team has gathered for training camps and international games almost every month. All the time together has forged the group into an inseparable unit. As the U-20 WNT grew throughout the cycle, so has Kim’s game. She still can outrun anyone on the field, but all of the time spent playing alongside the nation’s best has helped her to round out her skills. She’s worked on her weaker foot, combination play and getting her head on the ball. The overall improvements have made Kim ready to make an impact during the team’s run in France. As a substitute in the USA’s opener against Japan, Kim provided a spark off the bench and helped to create some quality chances. She came off the bench again against Paraguay and notched an assist on the USA’s sixth goal, which completed a historic hat trick for Savannah DeMelo. At the World Cup venues in France, flags fly for to represent the participating nations. That sight isn’t unfamiliar to Kim. It echoes back to those Fourth of July celebrations with all of her family’s origins waving in the wind.